The Ivey Family is involved in many different ministry initiatives in Peru. The Discipleship Ministry we currently use was begun in January of 2006. We found that many people in the churches in Peru didn’t know what it meant to truly follow the Lord Jesus Christ, so we began with three small groups of 12 people each in our house. Very soon after we began the study, several people accepted the Lord Jesus Christ. God has changed the lives and ministries of several pastors that have taken the study, as well as the lives of many other people, including us. Jesus has blessed this ministry tremendously because now we have over 8000 people that participate in discipleship groups, meeting in 13 of the 24 departments of Peru. Through this ministry, we make disciples who go out to reproduce more disciples. The study includes eighteen different books that are presented in a simple way, but the message is deep. We meet once a week in our house for two hours with each group. The study lasts approximately three years. Through this study, people learn to live in the Lord Jesus, to read the Bible for what it really says, and to apply it to their lives. After the participants have been in a group for about six months, they are encouraged to start their own small group, but they have to continue studying until they finish all the course. One of the most important goals in Peru is to train Christian leaders who can minister to others without our help. Therefore several times each year, we hold Leadership retreats for people who want to become discipleship group leaders in different places in Peru, for pastors who want to improve their ministries, and for those people who want to become more effective discipleship group leaders. In 2010, we began a three-tier approach to our leadership training by holding Level 1 leadership retreats for new leaders and for helping people find their call in leadership, Level 2 leadership retreats for people who are already leaders and who are going deeper in their walk with Christ and in their leadership abilities, and Level 3 leadership retreats for national missionaries who oversee several discipleship groups in different places in Peru. Training national leaders is a way to be sure that the ministry does not die if the missionaries have to return to the states. Known as Kid’s Club to us in Peru, children’s ministries are touching many lives here. Kid’s Clubs meet each week in parks, fields, or schools – wherever we can find space and children. God called Mary Alice to begin Kid’s Clubs because she didn’t have a personal relationship with the Lord Jesus Christ as a child, and in her last year in the university, she even thought about committing suicide. After accepting Jesus as her Savior and Lord, He completely changed her life and gave her happiness and a hope that she had never had before. Because she wanted children to experience this happiness, she began to write lessons and to teach other Peruvians how to lead children to Christ. Today Kid’s Clubs are in many different places in Peru. A typical Club will have 30-80 children who come together to sing and dance to Jesus and to learn about what it means to have a personal relationship with Him. Incorporating music, puppets, skits, large group and small group lessons, the Kid’s Club lessons touch everyone in their learning style. Led by Peruvians for Peruvians, it is a way to disciple children and youth. It also gives an open door to evangelize the parents of the children who come. The ministry of evangelism can be done in many ways. Mary Alice helps people to learn how to share their faith with others wherever they might find themselves. There also are opportunities for evangelism by meeting people on the street, making friends, and leading them into a relationship with Jesus, or by making friends with neighbors. Alejandra Aquino is constantly sharing Christ with her neighbors, and many of them have accepted Christ. Many people have shared the gospel with some of their neighbors, and begun a discipleship group with them. At the Kid’s Clubs, the majority of the children come from the streets, and are led into a relationship with Jesus. Working with teams of medical professionals that come from the United States, we conduct 2 to 4 medical campaigns a year. 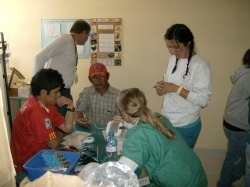 The teams from the United States join with the Peruvian team to offer medical, dental, and eye care. The team not only treats the physical man, but we have a spiritual team that shares the Gospel, as well as giving counsel and prayer. Through these events many people give their lives to the Lord Jesus Christ, and working with our national missionaries, we try to incorporate them into discipleship groups, and plant new house churches in these communities. We are always blessed to see how powerful the Gospel functions during each one of these events. The micro enterprise training was begun by Arthur and John Pearson with help from Roswell United Methodist Church. The training is geared toward encouraging Peruvians to start and run their own small businesses using Biblical principles and standards. Many people who may already have a small business benefit by learning how to run the business in a more efficient way and make it better by applying Biblical principles. In addition to the Biblical principles, the attendees learn how to evaluate the market and their business idea, how to develop business plans, and how to develop budgets. They learn principles of inventory control and other management skills. Several of those that have received the training have opened or improved their own small business. 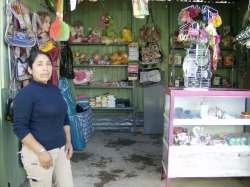 These businesses help to provide economic support for the national missionaries working with us here in Peru. The long term goal is to create enough income from Peruvian sources to maintain the ministry. Please join us in prayer for each of these ministry initiatives, and for the many, many other opportunities that are always present for ministry among the Peruvian people. Most of all, pray for relationships to develop and for the Gospel to be spread via relational ministries and love.